In real life they are accountants, bankers and business executives. Some have already reached retirement age. Today, these tourists from Hong Kong are pretending to be Israeli army commandos, specialists in counterterrorism. “Esh. Esh,” they shout back, this time upping the volume. By the time they’ve shot a few rounds of real bullets at their targets, they appear to be much less inhibited. In fact, they seem to be enjoying themselves. 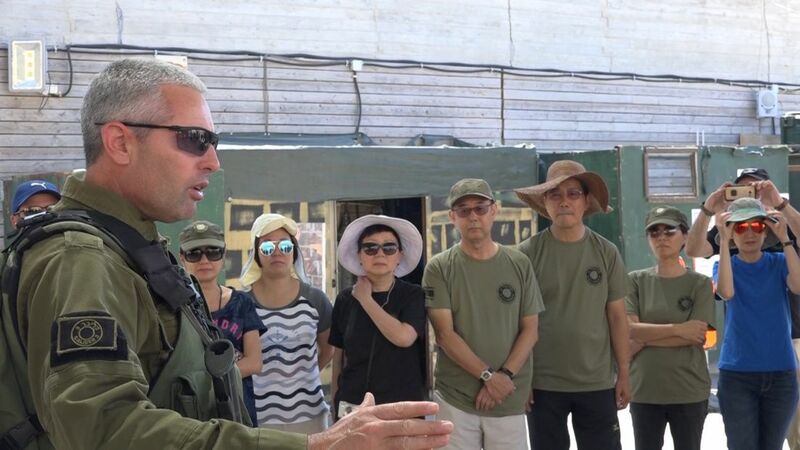 At Caliber 3, the two-hour “shooting adventure” – for which the group from Hong Kong has signed up – includes a simulation of a suicide bombing in a Jerusalem marketplace, immediately followed by a stabbing attack, a live demonstration with attack dogs and a sniper tournament. The cost of this basic package is $115 per adult and $85 per child, with discounts available for large groups. If they wish, participants can choose a more advanced program in combat rappelling, which lets them pretend they’re Israeli commandos on an Entebbe-like hostage-rescue mission. Sessions are also available in krav maga, the hand-to-hand combat considered a forte of the Israeli army. The tourists taking part in activities on a recent Friday morning seemed to be enjoying themselves – not minding the push-ups they had to do for not obeying the orders of their “commander.” When questioned, not one participant expressed concern that the activities might be seen as glorifying violence. 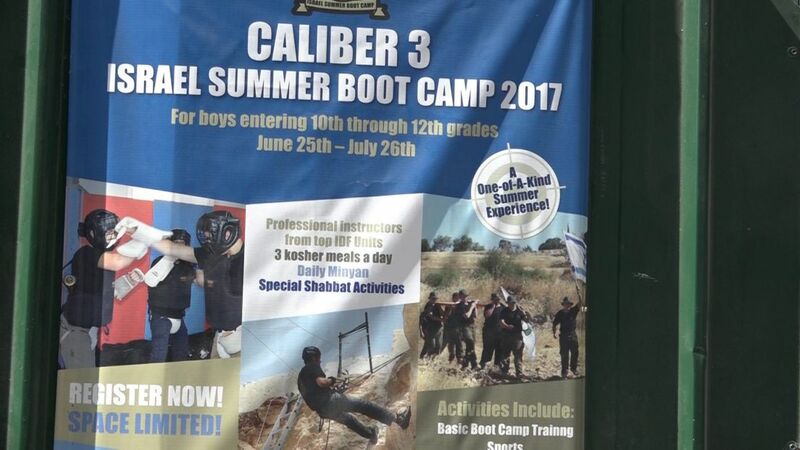 Aside from these daily offerings, Caliber 3 runs a month-long summer camp for teenage boys from abroad that includes, according to a large poster on the premises, “three kosher meals a day” and “a daily minyan” – the 10-man quorum required in Orthodox Judaism for reciting certain prayers. 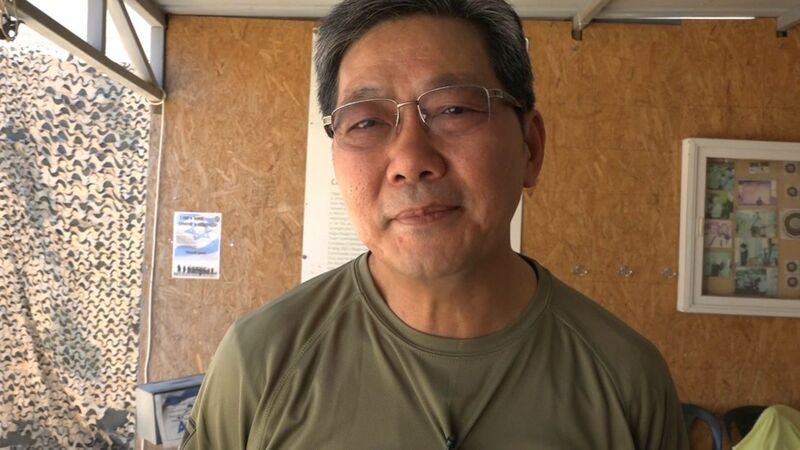 Sharon Gat, the founder and CEO, estimates that between 15,000 and 25,000 tourists visit his facility each year. The overwhelming majority are American Jews, many of them families visiting Israel for a bar mitzvah and other celebrations. But growing numbers in recent years have been coming from Brazil, Argentina, France, Italy, Russia and especially China on work-related trips and religious pilgrimages. Companies specializing in this sort of military tourism, she notes, have experienced a boom in business over the past year. “For a long time, it was popular for Jewish tourists, and especially organized missions, to visit Israeli army bases and meet with the soldiers and watch them during their military exercises,” says Sand, the founder of Travel Composer, a boutique Israeli agency that specializes in luxury tours. Caliber 3 and its competitors make money not only from the programs they run, but also from the merchandise they sell, which includes everything from T-shirts to hard-core military equipment. But they don’t want to be seen – and this becomes clear in background conversations – as profiting from the almost constant threat of war and terror in Israel. That could explain these companies' tendency to describe their mission in more idealistic terms; as they put it, showing the world that all the awful things said about the IDF abroad have no basis whatsoever and that this is the most wonderful and moral army that exists. 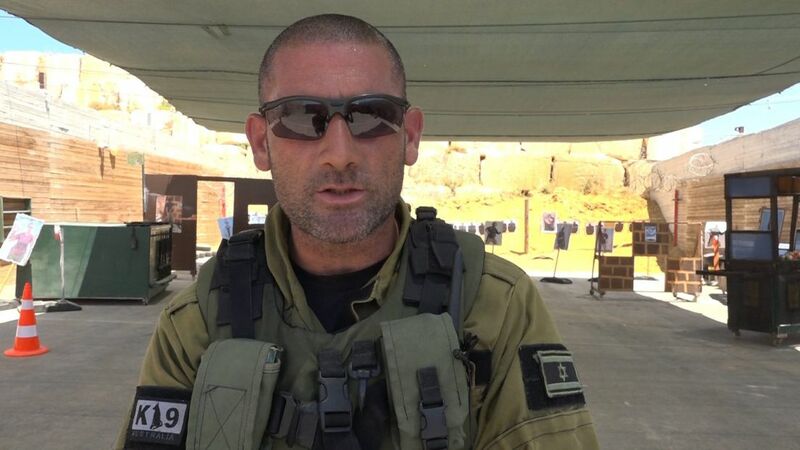 As his instructors like to point out, it’s not only Israeli soldiers who operate according to the army’s “purity of arms” doctrine, which stipulates that soldiers will maintain their humanity even in combat. So do their attack dogs. At a live demonstration, the visitors watch as Zeus lunges at a “terrorist” wielding a knife, forcing him to the ground while tearing into his padded coverall. But once that knife is dropped and the threat is eliminated, Zeus backs off. “Even the dogs in the IDF value human life,” the instructor says. Carmel estimates that between 5,000 and 8,000 tourists visit his facility every year. The most popular package is a four-hour boot camp meant to mimic basic training in the Israeli army. Participants dress up in Israeli army fatigues, wear dog tags and even eat special IDF combat rations. They practice krav maga, rappelling on buildings and sharpshooting out in the field. Depending on the number of participants and whether other special activities are included, the price ranges from $50 to $250 per participant. Based in Jerusalem, Zikit Extreme offers a more intensive program called “IDF special forces experience” in which tourists dress up in camouflage, participate in a “stretcher march” – a rite of passage for Israeli soldiers – and practice combat in closed spaces. “The program is really popular with families, especially those on bar mitzvah trips,” says manager and owner Ohad Nachum. The program at Zikit Extreme takes an entire day and can cost anywhere from $100 to $600 per person. Back at Caliber 3, Matt and Susan Parker are feeling relieved an hour into the morning activity. Their 10-year-old son got frightened by the sound of gunshots when he walked in and threatened not to participate. But by now, as his father describes it, he’s eager for his next turn shooting an assault rifle. From Westchester County, New York, the Parkers are visiting Israel to celebrate the bar mitzvah of their older son. “The kids don’t want to go to museums, and this is something totally different, unique and cool,” says the father, a wealth adviser at Morgan Stanley.